Hamilton House is located on westbound West Main Street / Old Highway 12, west of its intersection with North Fremont Street, at 328 West Main Street, Whitewater, Wisconsin, Wisconsin 53190. 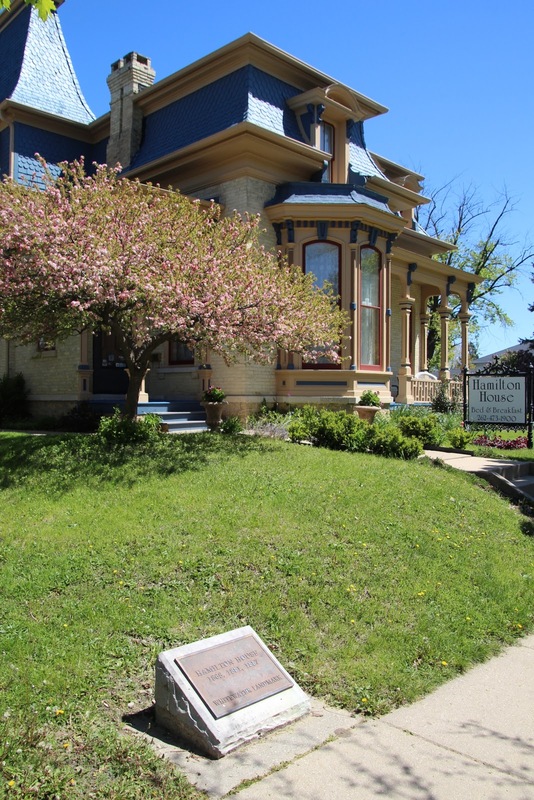 In 1868 the Hamilton House was built by Dr. Green, Whitewater’s first dentist and was probably built as a simple gabled ell with Italianate details. In 1881 it was remodeled and the elaborate mansard roof with arched dormers was added at that time which changed entirely the style of the house. The house was again remodeled in 1887. Its details include Second Empire style bay windows with brackets, dentils, pilasters and panels; two Second Empire porches; a Queen Anne porch with turned posts, spoon and spindle work, brackets, a pediment; and a two-story Queen Anne style bay window on the west wall. Two tunnels have been discovered in the basement leading to speculation that it may have been part of the Underground Railroad. Hamilton House is located in Whitewater, Wisconsin.